Our cabin B607 has a queen size bed and a small deck and plenty of storage space - great with our three suitcases. Its on the 11th deck so we''l get lots of "stairmastering". Buffet is on the 14th. Dinner is on the 6th. Activities primarily on the 6th and 7th decks. Pool/HotTub was on the 14th, but even the "indoor" pool atmosphere never got very warm, so we didn't use the hot tub, oh well. We had lunch at the buffet, unpacked, and explored the ship for the afternoon. It was similar to the Princess ship we had through the Panama Canal, but lacking a few amenities (like our favorite bow lounge area, and a stern shuffleboard area that was also great lounging). After the life-jacket ship's emergency drill, we were ready for dinner. At dinner we were seated with a couple from Australia and a couple from England. It turns out that we are on a portion of a repositioning cruise. The cruise started in Singapore, came through the Suez Canal, and to Rome. Our tablemates had already been on the ship for almost two weeks. It was a pleasant pairing, but we declined joining them for after dinner activities - went to our cabin and crashed. The ship headed off to the port of Liverno Italy. We arrived in Rome (Leonardo da Vinci - Fiumicino) Airport Wednesday morning and have a nine hour time difference (from Las Vegas). Waiting at the luggage carousel are both of our suitcases and a representative of the cruise line to take us to the bus that takes us to the ship at Citivavecchia (OK, Port of Rome). One suitcase had a big dent in a side corner - we discovered later that one of our two cameras had it's display screen cracked (it still takes pictures, you just can't aim it or view anything). The day was beautiful, but no, we hadn't scheduled any tour time in Rome or Vatican City. 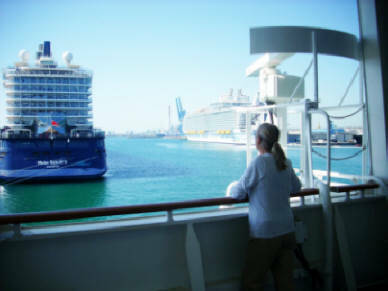 At the port, there are two ships. Ours is the "Sapphire Princess", an "old standard" Panama Canal size approximately 3,000 passenger ship. The other ship is the "Explorer of the Seas" from Royal Carribean, (sorry, no photo) a "new standard" size for the new bigger-wider Panama Canal. It took up two cruise ship dock positions. We are told that it has about 5,000 passengers, and is currently the largest cruise ship in the world. Fortunately, they have completed their boarding, so we are not competing for terminal space. The boarding process goes smoothly, if a bit slowly. Our passports are photographed, and we are photographed and issued an ID card. As we enter or leave the ship, we of course have to show the card, and the security guy checks that we match our ID's photograph. Their luggage scan is probably more interested in preventing "illegal booze and wine" than in preventing other materials (remember, this is luggage that has been through airport security scans and has been transported by their personnel).